Report From Ciber-Art Bilbao Conference 2004 | JONAH BRUCKER-COHEN, PH.D. Report From Ciber-Art Bilbao Conference 2004 – JONAH BRUCKER-COHEN, PH.D.
Set in the post-industrial city of Bilbao, Spain, the Ciber-Art Bilbao conference was a lively mix of interactive art exhibitions, performances, concerts, and a comprehensive paper session where artists and practitioners presented their work and theories on the future of digital culture. The festival’s main objective was to situate Bilbao on the digital art map by creating an event with global participation from internationally known media artists. Although the art exhibition opened a week earlier, I arrived as the five day long conference sessions began. One problem with the structure of the conference was the attempt to integrate the local media art presence, since the program booklet failed to translate Spanish speaker’s talks into English and vise versa. This is an account of what I was able to experience, although with concurrent panels running back to back, the breadth of the conference was impossible to completely cover. 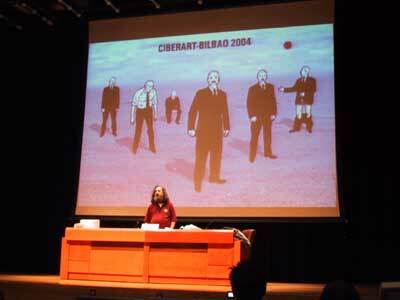 The opening presentation was by “Free Software” pioneer and grassroots hero, Richard Stallman. Based in Cambridge, Massachusetts, Stallman, who wrote the GNU (which stands for GNU’s Not Unix) operating system as an alternative to proprietary systems like Windows, outlined the four tenets of the free software movement: 1) The ability to run a software program, 2) The freedom to help yourself to the source code and change it, 3) The freedom to distribute copies of your modifications, and 4) The desire to help to build your community by publishing a modified version. His talk outlined why these freedoms are important to the premise of giving you complete “control” over your computer and your ability to use it freely. Having unrestricted access to source code and the work of like-minded programmers perpetuates the proliferation of goodwill and exchange among independent producers. He went on to demonstrate whether or not these ideas applied to hardware, as well as software by trying to deconstruct the use and misuse of a physical object: a chair. However this argument fell short because software allows for an economy of scale. When creating software it is easier for an individual to create many copies than one, whereas with hardware making many copies is more difficult and costly. The paper topics presented over the next few days ranged from examinations of online memes, location-based GPS art projects, networked accessories, and formal overviews of art and technology practice. Mirko Tobias Schafer, from the Institute of Media and Re/presentation at the University of Utrecht spoke about how the hacking and modification of existing technology has been integrated into the next versions of the hacked object. One example is the website, Aibohack.com, which profiles a hobbyist’s software and hardware mods of the popular robotic dog, some of which Sony plans to integrate into their next version. Giving an overview of academic institutions in the US supporting art and technology, was Duke University’s Edward A. Shanken. Shaken sees collaborations between artists and scientists as an interface for research to engage with the public. This attitude was also prevalent in Susan Kozel’s keynote address where she outlined details of her wearable projects that aim to engage the public through social performative experience. Kozel, a professor at Simon Fraser University, outlined her aim to develop clothing that can connect its wearer’s biometric data with others over a local network and produce vibro-haptic feedback on the surface of the garment. Thus the clothing becomes a relay of mood and emotion within social proximity. Also exploring immediacy of interaction, Eric Paulos of Intel Research Berkeley, gave the third keynote about his recent work in “Urban Atmospheres”. The project is a detailed account of the proliferation of close-knit urban spaces where public passivity often upstages collective engagement. His aim is to reverse this assumption through a “carnivalization” of everyday encounters into playful interventions where everyday individuals can engage with the people or strangers occupying similar spaces. His latest project, “Jabberwocky” manifests itself as a Bluetooth enabled mobile phone application that connects to others to visualize and encourage connections between ‘strangers’ who frequent similar spaces. Paulos was asked if this type of community reflection could have a negative effect for people who enjoy their anonymity. Like most tracking related projects, the obvious answer is that most people give up a certain amount of freedom regardless of their desire to be tracked, simply by owning a mobile phone or using a credit card. This type of surveillance fear was debated through the conference as the promise of technology in most presentations often left out the repercussions and baggage it entails. Across town, in a large warehouse space, the art exhibition featured several large-scale interactive installations, and hundreds of screen-based terminals behind giant car-wash plastic flaps. “Evident Traces”, a mini-show at the festival, curated by Christiane Paul, featured several works that attempted to engage the user on a physical level. One of these projects was NYC-based artist, John Klima’s long awaited “Terrain Machine”, a real-time depth display with hundred of motorized potentiometers with stretched spandex connecting each point. 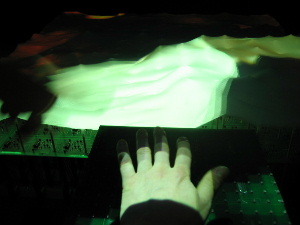 The result is a moving “terrain” with a projected image of a woman floating on the surface, allowing users to manipuate the depths of the pots as they cast a shadow. Also in Paul’s selection was Susan Kozel’s “Between Bodies”, the second phase of the wearable sensing project, “whisper”,but featuring a series of skirts that send signals amongst each other via PocketPCs to effect physical stimuli such as electric fans and motors. Also present were Sibylle Hauert and Daniel Reichmuth’s “Instant City”, a tangible sound installation that allows people to create sound mixes by placing translucent plastic blocks on a light table. Depending on the amount of light that passes through the stacked blocks, different sound samples would play. 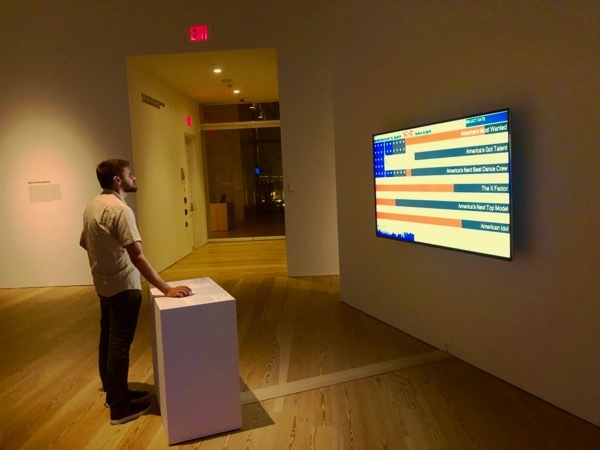 Other notable additions were NYC based artist Daniel Shiffman’s “Reactive”, a particle-based video parser, and MEART – The Semi Living Artist’s “Symbotica”, which used artificial life simulations coupled with a pneumatic robotic drawing machine. Leaving the conference early, I missed out on the Planetary Collegium events scheduled for later in the week. Regardless, it seemed as if the prevailing attitudes expressed outlined how the promise of technology as a social leveler becomes more evident with re-appropriation and disruption of existing contexts of interaction, place, and social engagement. Is creativity the ultimate social equalizer? When does technology lose relevance to the idea trying to be conveyed? From the numerous installations that challenged how forms of media can displace their traditional modes of representation, to papers that explored how the proliferation and mutation of ideas is causing a rift in popular culture, the Ciber-Art Bilbao provided an interesting perspective on the role of the digital instigator.